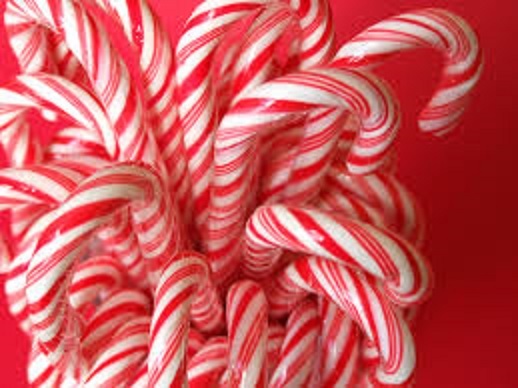 Treat family and friends to homemade candy this holiday season with these recipes adapted from King Arthur Christmas Candy recipes. Mix the cranberries and pecans together. Set them aside. Melt the dark chocolate and spread it into an 8″ x 12″ oval on parchment paper placed on a baking sheet. 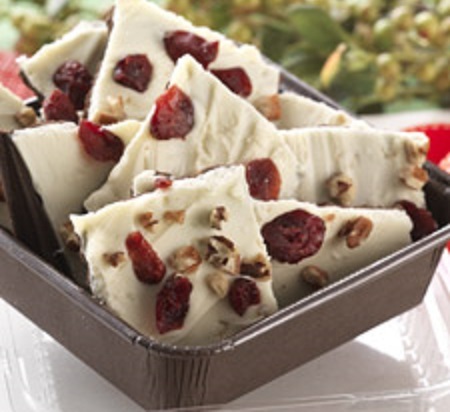 Melt the white chocolate and mix it with 3/4 cup of the cranberries and pecans. Allow the candy to cool until hardened; then break it into chunks. *If you use unsalted butter, add 1/2 teaspoon salt to the mixture. In a large, deep saucepan melt the butter. Stir in the sugar, water and corn syrup and bring the mixture to a boil. Boil gently, over medium heat, until the mixture reaches the hard-crack stage (300°F on an instant-read or candy thermometer). The syrup will bubble without seeming to change much for a while, but be patient; all of a sudden it will darken and at that point you need to take the temperature and see if it’s ready. (If you don’t have a thermometer, test a dollop in ice water; it should immediately harden to a brittleness sufficient that you’ll be able to snap it in two, without any bending or softness). This whole process should take about 10 to 12 minutes. Do not leave the mixture unattended – too long on the heat and the syrup will burn. While the sugar mixture is gently bubbling, spread half of the nuts in a closely packed, even single layer, on a lightly greased baking sheet (a half sheet pan works well here). Top with half the chocolate. When the syrup is ready, pour it quickly and evenly over the nuts and chocolate. Immediately top with the remaining chocolate, then the remaining nuts. Wait several minutes, then using the back of a spatula, gently press down on the chocolate-nut layer to spread the chocolate around evenly. While the candy is still slightly warm, use a spatula to loosen it from the baking sheet and move to a piece of parchment paper on the counter top. When cool, break it into uneven chunks. Yield: about 24 big bite-sized pieces. 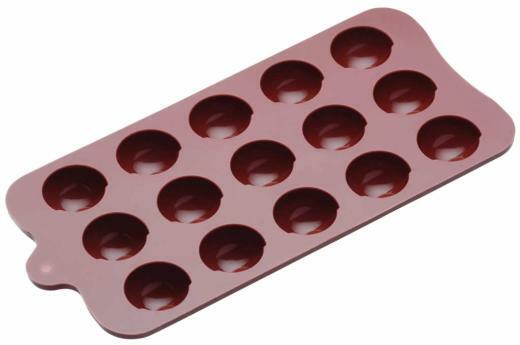 Butter two 8″ x 8″ or 10 1/2″ x 6 1/2″ pans. Measure the vanilla into a small container and set it aside for later. Cut the butter into 1″ chunks, to help it melt faster. Combine the cut-up butter, half & half, corn syrup, sugars and salt in a heavy-bottomed, 5- to 6-quart saucepan. Cook slowly, stirring constantly, until the mixture reaches 248°F, or until a small amount dropped in cold water forms a firm ball. Remove the pan from the heat and carefully stir in the vanilla; the mixture will bubble and boil. Quickly pour the caramel into the prepared pans. Don’t scrape any of the residue from the bottom of the pot onto the pans. Wait 30 minutes, then sprinkle with coarse-flake sea salt, if desired. Cover the candy securely, and refrigerate. Allow the candy to warm up a bit or it’ll shatter when you bang the pan. Remove the candy from the pan by loosening its edges with a knife or offset spatula and banging the pan on a cutting board until the slab releases from the pan. 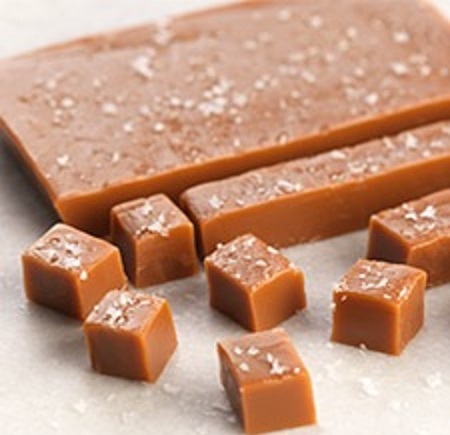 Cut the caramel into squares and wrap in waxed paper. Store in the refrigerator for the longest shelf life. Wrapped caramels can also be frozen. Yield: about 10 dozen 1″ caramels. Preheat the oven to 300°F. Line an 8″ round cake pan with parchment (or foil) and grease the parchment. Set the pan aside. Toast the hazelnuts and almonds for 20 minutes, until they’re a light golden brown on separate baking pans. It’s best to do this in separate pans as the nuts toast at slightly different rates and you may want to take one pan out of the oven before the other. Remove the nuts from the oven and set them aside to cool. When you can handle them, chop them coarsely. Put the nuts, candied peel, spices, salt and flour in a mixing bowl. Stir to combine. Combine the sugar, honey and butter in a saucepan and place an instant-read or candy thermometer on the side of the pan. Over medium heat, bring the mixture to a boil, stirring frequently, until it reaches a temperature of about 245°F. This happens very quickly, so don’t walk away; it should take about 2 minutes (or less) from the time the syrup starts to boil. Immediately pour the boiling syrup over the fruit and nuts in the bowl. Stir to combine and pour into the prepared cake pan, smoothing the top with a spatula. You need to work fast, as the mixture will start to stiffen up. Place the cake pan on a baking sheet. Bake for 40 to 45 minutes; it won’t seem firm, but will set as it cools. Remove the pan from the oven and after 45 minutes loosen the edges with a table knife or heat-proof spatula. Turn the warm panforte out of the pan onto a piece of parchment or foil. The bottom is now the top. Sprinkle the top of the panforte heavily with confectioners’ sugar, gently rubbing it in, if desired. Let it cool completely before wrapping airtight. Add 2 tablespoons Dutch-process cocoa to the nuts/peel/flour mixture. Melt 1/2 cup semisweet or bittersweet chocolate chips; stir them into the nuts/peel/flour mixture along with the honey syrup. Bake as directed in the recipe above. Line an 8 x 8 pan with parchment paper or aluminum foil and spray lightly with non-stick baking spray. Place 1/2 cup cream in a medium saucepan. Add the espresso powder, corn syrup, salt and sugar. Stir over medium heat until the espresso powder and sugar are dissolved and the mixture begins to boil. Cover the pan and let boil for 3 minutes. Uncover the pan and check the temperature; it should be 235°F to 240°F (soft ball stage). If it is, remove from the heat; otherwise let it boil for a minute or two more. Once the mixture reaches 235°F to 240°F, add the vanilla. Be careful; it will splash and splutter when it hits the hot liquid. Set the mixture aside for about 10 minutes to cool. Meanwhile, place the remaining 1/2 cup cream into another saucepan. Heat until it’s just beginning to steam. Remove from the heat and add the white chocolate. Let sit for about 5 minutes to melt. Then whisk vigorously until the mixture is shiny and smooth. Add the sugar mixture to the chocolate mixture; stir to combine. Combine the cocoa and ½ teaspoon espresso; sprinkle the chocolate with half the mixture. Refrigerate for at least 4 hours, to set. Turn the chocolate out of the pan and flip it over; sprinkle with the remaining cocoa/espresso powder blend. Cut into 1 inch cubes. Stack two or three on a wooden stick and wrap in waxed paper or plastic wrap to store. Yield about 64 blocks, 21 servings. When it comes to giving this holiday season, be creative and make a truly personal gift for your friends and family. Homemade mixes are also one of the best Christmas gifts. 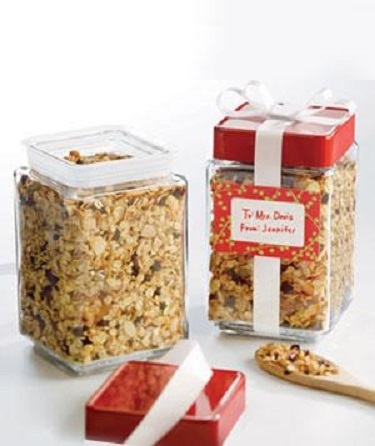 There’s nothing like a homemade food gift, beautifully packaged along with recipe cards, to add warmth to the holidays. Adjust the oven rack to an upper-middle position and heat oven to 325 degrees F. Line a large rimmed baking sheet with parchment paper. Whisk maple syrup, brown sugar, vanilla, salt and cinnamon in large bowl. Whisk in oil. Fold in oats and almonds until thoroughly coated. Transfer oat mixture to prepared baking sheet, spread across sheet into a thin, even layer (about 3/8-inch thick). Using a stiff metal spatula, compress oat mixture until very compact. Bake until lightly browned, 50 minutes, rotating pan once halfway through baking. Remove the pan from the oven and cool on a wire rack to room temperature, about 1 hour. Break into pieces of desired size and package in decorative containers for gifts. In a small bowl combine tea, crystallized ginger, allspice and cloves. Divide tea mixture and dried apple slices among six paper tea filters. Tie the tops of the filters with kitchen string, tying a cinnamon stick at the top of each. Place filled tea filters inside six decorative heat-proof mugs. 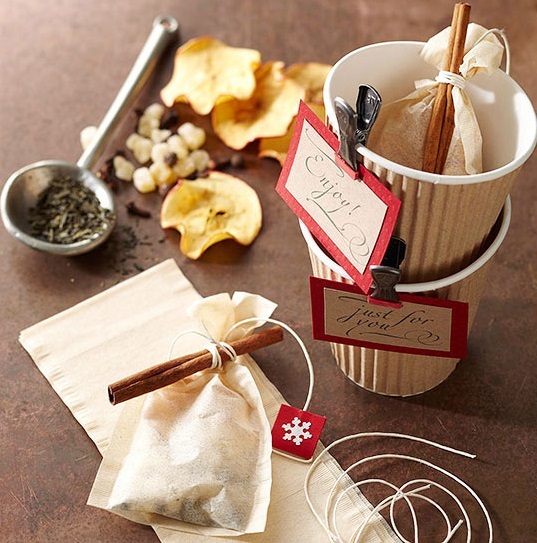 To Make Spiced Apple Tea: Add 6 to 8 ounces of hot water to one mug. Add a tea bag and let steep for 3 to 5 minutes. Remove and discard the tea bag. Place cinnamon stick in the mug and serve. 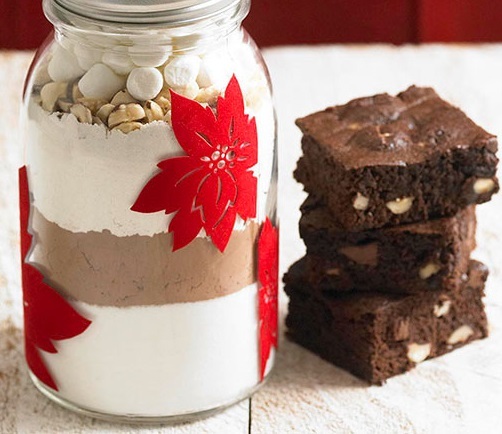 In a 1-quart decorative jar layer sugar, cocoa powder and chopped chocolate. In a small bowl stir together flour, baking soda and salt. Spoon over chocolate in the jar. Top with hazelnuts and marshmallows; fasten lid. Attach the following directions for making brownies. Preheat the oven to 325 degrees F. Line a 9x9x2-inch baking pan with foil, extending foil over the edges of the pan. Grease the foil; set pan aside. In a large bowl whisk together 2/3 cup melted butter and 3 eggs until well combined. Add the contents of the jar to the butter mixture; stir until well combined. Spread batter evenly in the prepared pan. Bake for 35 minutes. (Moist crumbs will remain attached to wooden toothpick inserted near center of brownies). Cool brownies in the pan on a wire rack. Use foil to lift uncut brownies out of the pan. Place on a cutting board. Cut into bars. In a medium bowl, whisk together the flour, baking powder, sugars and salt. Mix in the coconut and pecans. 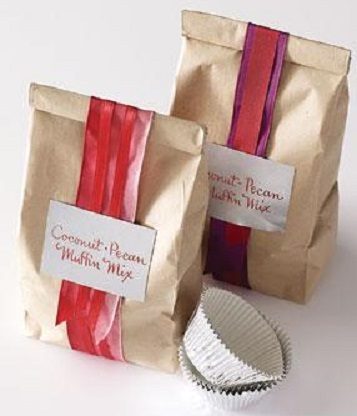 Transfer the mix to a resealable decorative paper bag. Wrap with ribbon and affix with a label and a gift tag with the baking instructions. 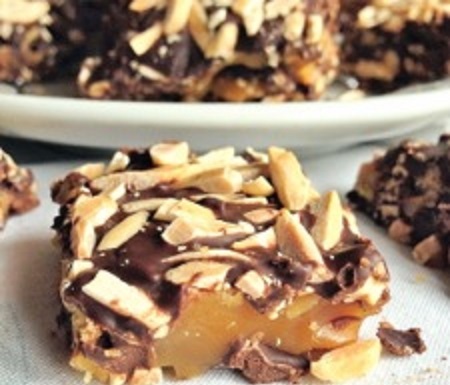 Coarsely chop both chocolates and set aside. Heat the cream and instant coffee in a saucepan, stirring to blend. When bubbles start to form along the edge of the pan, remove from the heat. Scatter the chocolate over the cream, stirring gently until melted. Set aside for 8 to 10 minutes. Add the liqueur and vanilla. Stir gently, just until evenly blended. Scrape the chocolate into a shallow bowl. Cool on a rack for 15 minutes, then cover the bowl with plastic wrap and refrigerate until firm, at least 4 hours or up to 1 week. 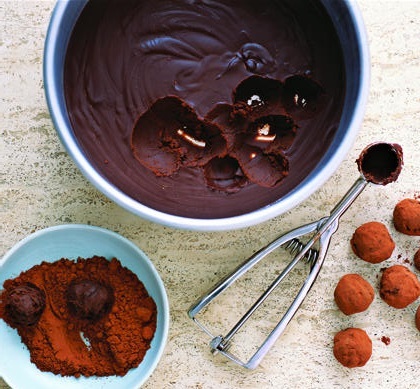 Using a teaspoon or a melon baller, scoop up enough chocolate to make balls 1 inch in diameter. Place the balls on a parchment-lined baking sheet. Refrigerate for 15 minutes. Thoroughly combine the cocoa and powdered sugar in a bowl, making sure all the lumps are removed. Roll the balls in the cocoa mixture, shaking off the excess, then transfer to wax paper. 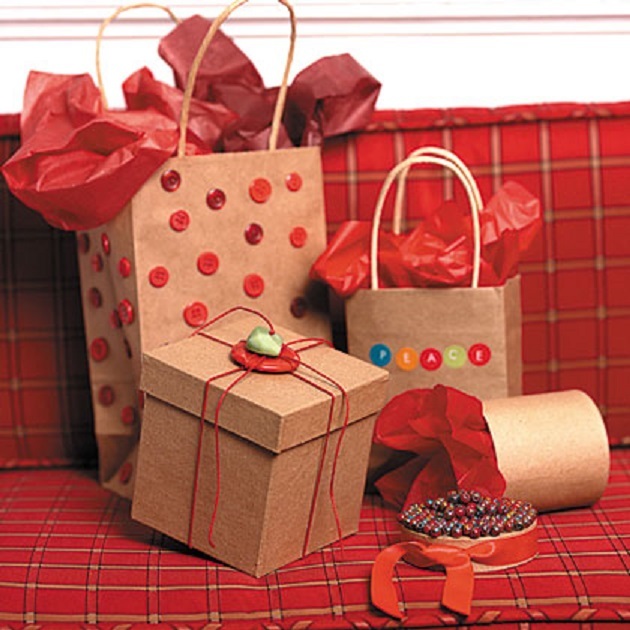 Place each truffle in a candy paper cup and package in a decorative gift boxes. This is the season for graduations, showers and a host of other occasions – all reasons to have a spring get together with friends and family. 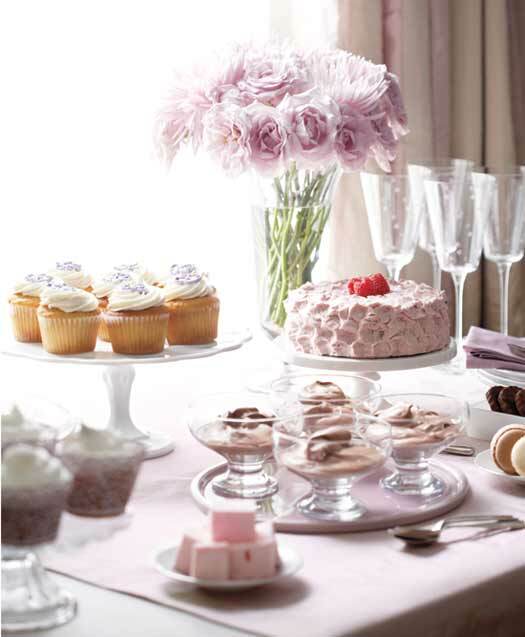 To entertain with elegance, not extravagance, host a dessert party. People will love you for giving them the chance to be just a bit indulgent. A dessert buffet works well in the late afternoon or as an after dinner event. You can easily make the buffet smaller or larger simply by subtracting or adding desserts. Keep the setting simple: Let single-flower arrangements and the beautiful desserts displayed at interesting levels in plain sight put the focus on what the guests really came for – a good time. Set up the buffet table―minus the desserts and beverages―the night before. Before setting out your dessert spread, keep these table tips in mind. If you have a cake stand, use it. The height will add visual impact to the table and will offer a bit of extra space on the crowded buffet table. Set out dishes of your favorite chocolates or chocolate-covered nuts. Place the plates at the far end of the table, the desserts in the middle and the beverages, cutlery and napkins at the other end of the buffet table. You can never have too many cocktail napkins, both on the buffet and on end tables. There’s no need to offer a full bar – regular and decaffeinated coffee, several kinds of tea and a sparkling wine and a fruity white wine are more than enough. Select desserts with contrasting and complementary textures and flavors. Mix sweet and tart, smooth and crunchy, add a pleasing spice or highlight a big, bold taste — like dark chocolate! Make one showstopping dessert to dazzle your guests and let the others play minor, but still important, roles. It’s smart to provide some lighter sweets to go along with the decadent ones — for example, a fresh fruit platter. Cookies are always a big hit — especially if children are present. Plan as many make-ahead desserts as will work well on your menu. All of the desserts below can be made well in advance of your party. Preslice cakes, pies and tarts, but do not separate the slices. Arrange cookies in baskets, plates or unique decorative containers. Brush the inside of 8 or 9 inch springform pan with melted butter. Mix walnuts and cookie crumbs in small bowl; spread evenly in the pan, coating the bottom and sides. Beat cream cheese and 3/4 cup honey with a mixer at medium speed until smooth, scraping down bowl’s sides occasionally, about 3 minutes. Beat in eggs one at a time; beat in milk and vanilla. Beat in flour, cinnamon and salt. Pour into the crumb covered pan. Bake about 1 hour and 10 minutes or until lightly browned and a little puffed. Cheesecake will jiggle in the center but will set as it cools. Cool on a wire rack 2 hours. Cover and refrigerate. 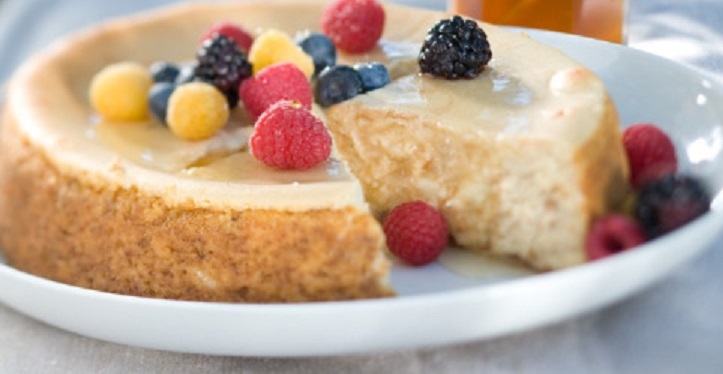 To serve, drizzle with remaining 2 tablespoons honey and garnish with fresh berries. Bake hazelnuts in a shallow pan at 350°F, stirring occasionally, 5 to 10 minutes or until toasted. Microwave chocolate chips and whipping cream in a 2-cup glass measuring cup at HIGH for 1 1/2 minutes or until chips melt, stirring twice. Stir in liqueur. Pour into a wax paper-lined 15 x 10 inch jelly roll pan; freeze 2 hours or until firm to touch. Shape 1/2 teaspoon chocolate mixture around each hazelnut, coating completely and place on wax paper. Microwave white chocolate baking squares in a 1-quart microwave-safe bowl at HIGH for 1 1/2 minutes or until melted, stirring twice. Stir together flour, salt and baking soda. Add to butter mixture alternately with sour cream, beginning and ending with flour mixture. Beat at low-speed just until blended after each addition. Stir in lemon zest and 1/2 cup coconut. Pour batter into a greased and floured 9 x 5 inch loaf pan. 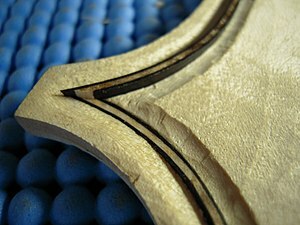 Bake for 1 hour and 5 minutes to 1 hour and 10 minutes or until a long wooden pick inserted in center comes out clean. Cool in pan on a wire rack 10 to 15 minutes; remove from pan to wire rack and cool completely (about 1 hour). 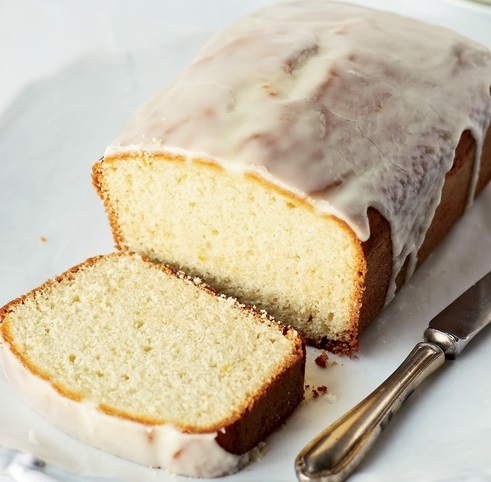 Spoon Lemon Glaze over cake and sprinkle with remaining 1/2 cup coconut. Lightly salting the watermelon brings out its flavor. 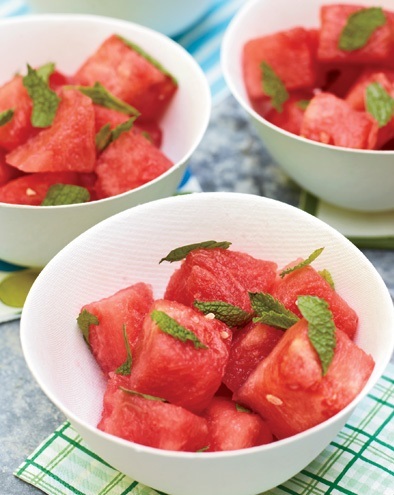 In a large bowl, toss the watermelon chunks with the lime juice and cayenne. Fold in the mint leaves. Season lightly with salt and chill until serving time. MAKE AHEAD The watermelon salad can be refrigerated overnight. Fold in the torn mint leaves just before serving. In a medium saucepan melt and stir butter and unsweetened chocolate over low heat until smooth. Remove from heat; cool. Preheat oven to 350 degrees F. Line an 8 x 8 x 2 inch baking pan with foil, extending the foil over the edges of the pan. Grease foil; set aside. In a small bowl stir together bourbon and coffee granules; set aside. Stir sugar into cooled chocolate mixture in the saucepan. Add eggs, one at a time, beating with a wooden spoon just until combined. Stir in vanilla and bourbon mixture. In a small bowl stir together flour and baking soda. Add flour mixture to the chocolate mixture, stirring just until combined. Spread batter evenly in the prepared baking pan. Bake for 30 minutes. Cool in pan on a wire rack. Using the edges of the foil, lift the uncut brownies out of the pan. Cut off the edges of brownie and save for another use. In a small saucepan bring whipping cream just to boiling over medium-high heat. Remove from heat. Transfer 1/2 cup of the hot cream to a small bowl. Add milk chocolate chips (do not stir). Let stand for 5 minutes. Stir until smooth. Cover loosely and chill for 1 to 2 hours. Add semisweet chocolate chips to the remaining hot cream in the saucepan, stirring until smooth. Set aside. When ready to glaze petits fours, reheat Semisweet Chocolate Glaze over medium-low heat to reach pouring consistency, stirring constantly. Cut brownies into 1- to 1-1/2-inch squares. 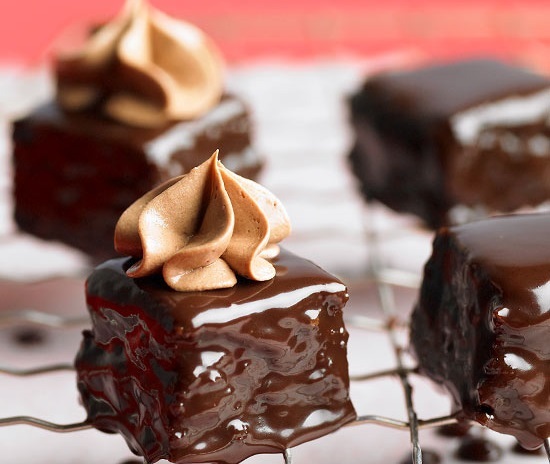 Coat petits fours with Semisweet Chocolate Glaze. Beat the reserved cooled milk chocolate mixture with an electric mixer about 30 seconds or until fluffy. Spoon frosting into a decorating bag fitted with a large star tip. Pipe large rosettes in the center of each petit four. In a large mixing bowl, beat butter with an electric mixer on medium to high-speed for 30 seconds. Add brown sugar, granulated sugar, baking powder, cinnamon, salt and baking soda. Beat until combined, scraping the sides of the bowl occasionally. Beat in eggs and vanilla until combined. Beat in as much of the flour as you can with the mixer. Stir in the remaining flour. 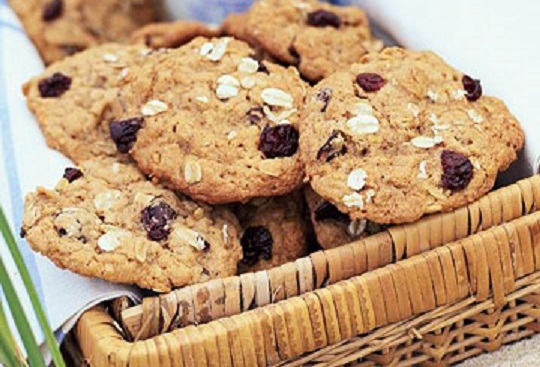 Stir in oats and dried cherries. Drop the dough by rounded teaspoons 2 inches apart onto ungreased cookie sheets. Bake in a 350 degree F oven about 12 minutes or until the edges are lightly browned. Cool on cookie sheets for 1 minute. Transfer to wire racks and let cool. Antonio Stradivari (1644-1737) was a crafter, like no other, of string instruments, violins, cellos, guitars, violas and harps. He created about a thousand Stradivarius instruments and about 650 survive today, mostly violins. 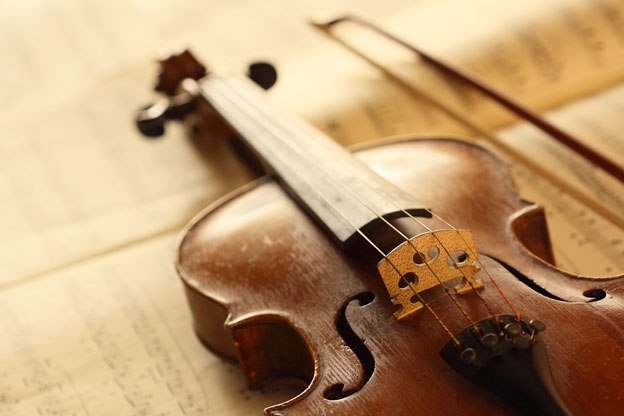 The violin was originally designed to imitate the human voice and was used for ballet and dance music. It became the most prized instrument for orchestra and melody. Both are used regularly and they actually mean exactly the same. The famous maker’s name was Antonio Stradivari, but it was customary at the time to latinise names, hence Stradivarius. He used Stradivarius on his violin labels and, therefore, it has become almost customary to refer to a violin made by Stradivari, as a Stradivarius. In fact it has almost become a superlative expression, meaning the absolute best, i.e. to be the “Stradivarius” of any field means “to be the best there is”. Antonio’s ancestry goes back to the 12th century in Cremona, Italy, the capital of violin makers, since the 16th century. Antonio’s parents were Alessandro Stradivari and Anna Moroni. Stradivari likely began an apprenticeship with Nicolò Amati between the ages of 12 and 14, although a minor debate surrounds this fact. One of the few pieces of evidence supporting this is a label in his 1666 violin, which reads, “Alumnus Nicolo Amati, faciebat anno 1666”. However, Stradivari did not usually put the master’s name on his labels, unlike many of Amati’s other students. M. Chanot-Chardon, a well-known French luthier, asserted that his father had one of Stradivari’s instruments with a label stating, “Made at the age of thirteen, in the workshop of Nicolò Amati”. This label has never been found or confirmed. Amati, though, would have been a logical choice for Antonio’s parents, since the master was from an old family of violin makers who were far superior to most other luthiers in Italy at the time. An alternative theory is that Stradivari started out as a woodworker because the house he lived in from 1667 to 1680 was owned by Francesco Pescaroli, a wood-carver. 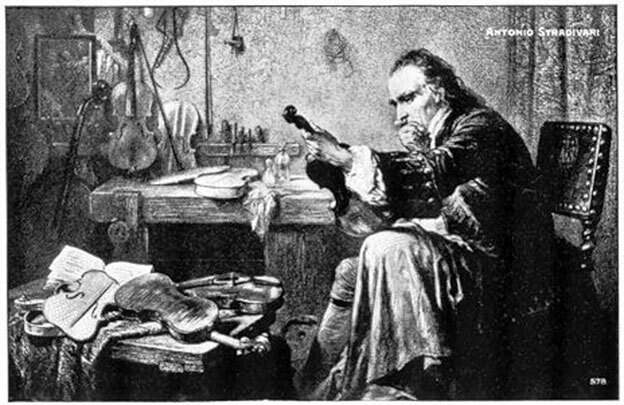 Stradivari may even have been employed to decorate some of Amati’s instruments, without being a true apprentice. This theory is supported by some of Stradivari’s later violins, which have elaborate decorations and purfling ( a narrow decorative edge inlaid into the top plate and often the back plate of a stringed instrument). Assuming that Stradivari was a student of Amati, he would have begun his apprenticeship in 1656–58 and produced his first decent instruments in 1660 at the age of 16. His first labels were dated from 1660 to 1665, which indicated that his work had reached a quality sufficiently high enough for him to sell directly to his patrons. However, he probably stayed in Amati’s workshop until about 1684, so as to use his master’s reputation as a launching point for his career. Stradivari was first married to Francesca Feraboschi with whom he had 5 children. After her death, he married Zambelli Costa with whom he had another 5 children. He lived on what is now Piazza Roma 1, where other famous violin-maker’s families lived at the time. Two of his sons, Omobono and Francesco, became violin makers. Though the violins’ construction was influenced by Amati, Stradivari soon developed his own style. His carved heads showed what a skilled craftsman he was and his violins became very popular throughout Europe. It was said that his secret formula for the varnish gave his violins their unique sound. He experimented with the shape and design of the violins and, in the 1690s, the Long Stradivarius with a larger pattern, flatter form, reclined sound holes and a darker, richer varnish emerged that all proved to be a crtical modifications. There were ornate violins, such as the collection made for the Spanish court in 1687, inlaid with ivory and with scrollwork round the sides. In 1688, Stradivari outlined the heads in black, one of the famous features of a Stradivarius’ violin from that period. Noblemen of the time commissioned him to make instruments for them and, as a result, Stradivari became famous during his own lifetime. Violins were considered fashionable and when the virtuoso violinist, Niccolò Paganini, played a Stradivarius, he was treated like the equivalent of one of today’s rock stars! Some of the earlier violins are referred to as “Amatise” and the later ones as “Long Strads” or “Grand Pattern.” They are all better known by their interesting names which they acquired due to the fame of the owner and by their appearance and sound. In 1698 Antonio began making a slightly shorter model and, between the years 1700-1720, which is considered his “Golden Period,” the violins had higher quality curves, rich varnish, gracefulness and a number of variations. The violins themselves are like characters, each unique, each having a name and a history, each with its own beauty – names like “Sleeping Beauty,” “Firebird,” “Lincoln,” “Spanish,” “Emperor” and “Leonardo da Vinci”. The “Davidoff” Stradivarius cello is owned by YoYo Ma, the “Barjansky” Strad belongs to Julian Lloyd Webber and “Soil” to Itzhak Perlman. The “Dolphin” is with the Nippon Music Foundation. The “Mendelssohn” sold in 1990 for £902,000, the “Kreutzer” sold in 1998 for £947,500. “Lady Tennant” sold for an enormous $2 million in 2005 through the Christie’s Auction House and “The Lady Blunt” (dated 1721) raised $15.9 million for the Japan Earthquake fund in 2011. The well-known “Molitor” was bought by Anne Akiko Meyers in 2010 at the Tarisio Auctions for $3.6 million, the “Hammer” (1707) sold in 2006 for $3.5 million and in 2012 the “Baron van der Leyen” Stradivarius sold at the Tarisio auction for $2.6 million. It is not surprising that because of the great value attached to the violins there are a number of forgeries, so these instruments must always be authenticated before purchasing. Museums and orchestras own and house many of the violins and violas but not all the violins are in use. However, the Vienna Philharmonic Orchestra owns several that are in use. The Library of Congress, the Royal Palace of Madrid, the Royal Academy of Music, the Musée de la Musique (Paris), the Metropolitan Museum of Art and the National Music Museum (South Dakota) all have instruments safely kept in good condition. The “Messiah” Stradivarius is not played but is housed at the Ashmolean Museum in Oxford, England. Antonio Stradivari was a master of his trade and for over sixty years he produced suburb instruments. 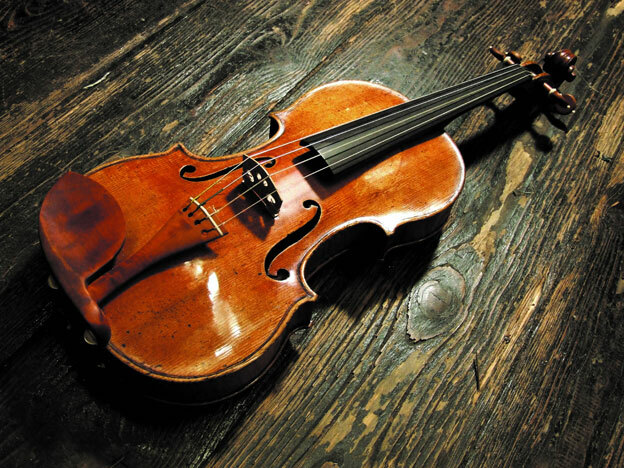 The last recorded violin was produced in 1737 the same year he died at the age of 93. Both Stradivari and Guarneri instruments are highly regarded today and judging by the value placed on them by society, these instruments are considered a treasure. George Eliot, the poet, captured this sentiment in a line from the poem, “Stradivarius” (1873): “When any master holds twixt chin and hand a violin of mine, he will be glad that Stradivarius lived, made violins and made them of the best’’. 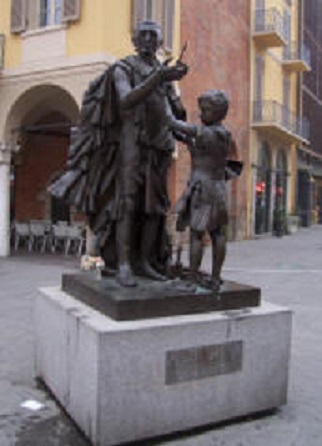 Statue in Cremona honoring Stradivarius. The city of Cremona is situated in Lombardy, on the left bank of the Po River. It is the capital of the province of Cremona and the seat of the local city and province governments. The city is especially noted for its musical history and traditions, including some of the earliest and most renowned luthiers. The Province consists of vast plains broken up by woods and large meadows that, thanks to the canals built by inhabitants in centuries past, has been transformed into an extensive, fertile countryside ideal for agriculture. The cuisine of Cremona brings the characteristic tastes of local farms to the table. Cured pork and sausages, including garlic-scented salami, cotechino with lentils, culatello ham and all types of pork that are important ingredients for local recipes. 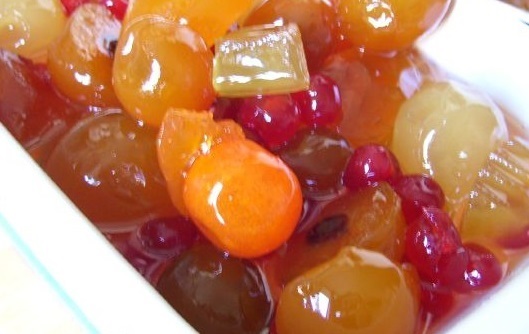 Pickled fruit (mostarda), made here since the Middle Ages, has become well-known. Large slices or whole candied fruit are mixed with mustard and cooked until thick. Mostarda is served with the rich, boiled meat dishes of the region. A typical Cremonese pasta is filled with boiled meats, mortadella and liver and it is served in broth. 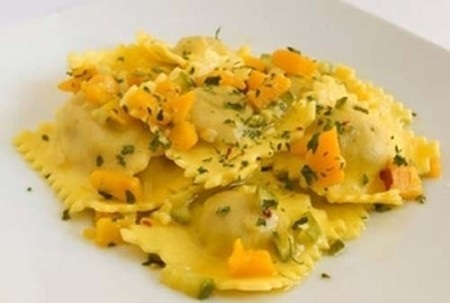 Tortelli are also a popular dish, as are Salva cheese, Bertolina (a sweet focaccia with egg) and the local dessert, Spingarda. From the ancient origins of this area comes torrone, nougat candy. Torrone was first made in 1441 to celebrate the marriage of Bianca Maria Visconti (the daughter of the Duke of Milan) and Francesco Sforza. Keep the individual kinds of fruit separate. Wash and dry the cherries and figs. Wash the apricots and remove the pits; do the same with the peaches and cut them into halves or quarters if they’re large. Peel, core and quarter the pears and quinces. Heat a quart of water in a large pot and when it begins to simmer slowly stir in the sugar. When it has dissolved, add the quinces. Simmer 20 minutes, then add the pears. Then the peaches, apricots, cherries and figs, at five-minute intervals. When you’ve added everything, simmer the mixture for 10 minutes, then turn off the heat and let the mixture cool. In the meantime, heat the vinegar and stir in the mustard. Let the mixture cool. Transfer the fruit from the syrup to sterile jars with a slotted spoon. Mix the syrup and the vinegar mixture, pour the combined sauce over the fruit, seal the jars in a processing bath and store them in a cool dry place. Peel and cube the squash and roast in a hot oven until it’s fork-tender. Grind the amaretti in a food processor and mince the raisins. When the squash is done, blend or process until mashed. Combine the pulp with the amaretti, raisins, cheese and nutmeg; mix well. Cover the filling with a damp cloth and let it sit in a cool place for several hours. Using an electric mixer with a dough hook, mix the ingredients to obtain a firm dough. Knead quite well, for 10-15 minutes or more. When you are ready to make the pasta, roll the dough out very thin with a rolling-pin or with a pasta maker (about 1 mm) and cut it into 4-inch (10 cm) squares. Put a tablespoon of filling in the middle of each square and top with another pasta square tamping down with a fork along the edges to seal them. Bring a large pot of water to a boil and then salt it. Cook the tortelli, a few at a time, for a few minutes, (usually they rise to the surface when cooked al dente) and then remove them with a slotted spoon or spider. They’re delicate and will break if you pour the pot into a colander to drain them. Put them in a serving bowl, sprinkling them with melted butter and grated cheese, as you add more cooked pasta to the bowl. Put the whole piece of meat into a pan with water to cover. When the meat starts to boil, add some salt and the diced onions and carrots. Add the rosemary, oregano and bay leaves. Cook the meat, until tender, about 2 hours over low heat. Add the fresh parsley and dill. Turn the heat off and leave the meat in the pan for another 15 minutes. Remove the meat and slice it. 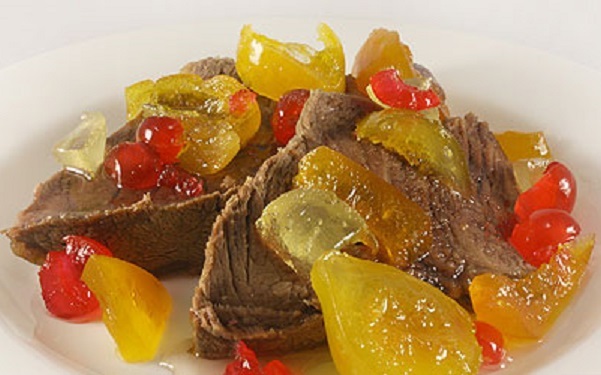 Put some meat slices on each serving plate and top with some fruit-mustard syrup and slices of fruit. 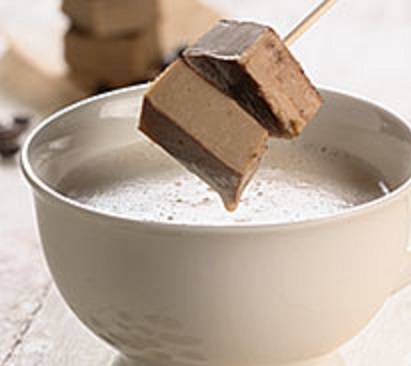 Torrone, the classic Italian nougat. 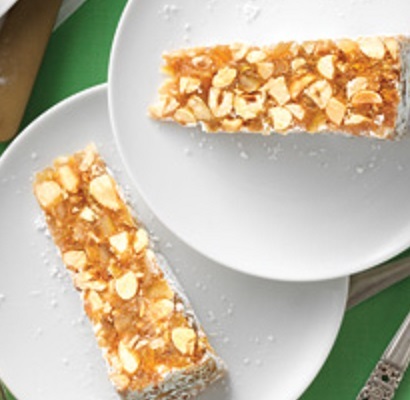 This traditional recipe is scented with honey, orange and almond flavors. As with many egg white-based candies, nougat does not do well in humidity, so try to choose a low humidity day to make this candy. 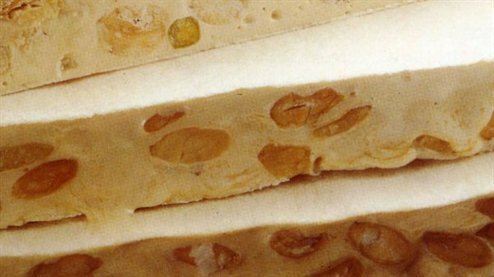 Traditionally, nougat is made with edible rice paper, to make it easier to slice and serve. If you cannot find any, line your pan with foil and spray it thoroughly with nonstick cooking spray. Smooth the top as best you can and skip the compacting step described below. Prepare an 8×11 inch pan by lining it with plastic wrap that extends over the sides of the pan, then spraying it with nonstick cooking spray, taking care to spray the sides well. (For thinner nougat, a 9×13 inch pan can be used instead.) Place the edible rice paper in a single layer on the bottom of the pan—you may need to cut the pieces to fit the pan. Combine 3 cups of sugar, honey, corn syrup and water in a large, deep saucepan over medium heat. The mixture will foam up as it cooks, so be sure your pan is large enough to safely handle the rising mixture. Stir until the sugar dissolves, then brush down the sides of the pan with a wet pastry brush to remove any stray sugar crystals. Insert a candy thermometer and cook the syrup, stirring occasionally, until the mixture reaches 290 degrees Fahrenheit (143 C). When the syrup reaches 270 F (132 C), start beating the egg whites and salt with the electric mixer using the whisk attachment. When the whites form soft peaks, add the remaining 2 tablespoons of sugar, a little at a time, until the whites are shiny and can hold firm peaks. Ideally, this stage should be reached when the sugar syrup reaches 290 degrees F (143 C), but if the whites are at stiff peaks before the syrup is ready, stop the mixer so the whites are not overbeaten. Increase the speed of the mixer to medium-high and continue to beat the egg whites for 5 minutes, until very thick, stiff and shiny. Add the three extracts and beat briefly to incorporate them. Add the toasted almonds and stir until they’re well-incorporated. The candy will be very sticky and stiff. Scrape the candy into the prepared pan, then use an offset spatula or knife sprayed with nonstick cooking spray to smooth the top. Cover the top completely with another layer of rice paper, cut to fit. Place a pan of the same size on top of the nougat and place a large book or other heavy object in the pan to weigh it down. Let sit at room temperature for several hours. When you are ready to cut the nougat, lift it from the pan using the plastic wrap as handles. Spray a large sharp chef’s knife with nonstick cooking spray and cut the nougat into small squares. If the knife gets too sticky, periodically wash it with hot water, dry it between cuts and re-spray. Nougat can be served immediately or stored in an airtight container at room temperature. It is sticky and will gradually lose its shape once cut, so for storage purposes, wrap individual squares in nonstick waxed paper. The most common Valentine’s Day symbols are the heart, particularly in reds and pinks, and pictures or models of Cupid. Cupid is usually portrayed as a small winged figure with a bow and arrow. In mythology, he uses his arrow to strike the hearts of people. People who have fallen in love are sometimes said to be “struck by Cupid’s arrow”. Other symbols of Valentine’s Day are couples in loving embraces and the gifts of flowers, chocolate, red roses and lingerie that couples often give each other. To celebrate this lovers’ holiday Italians give each other flowers, plan romantic dinners and present each other with chocolates, much like in the United States. The renowned Italian chocolate maker, Perugina celebrates this day by making a special edition of the Baci chocolate candies with a shiny red wrapper and a sweet red cherry and liquid center rather than the traditional hazelnut one. These chocolates are always a favorite and inside the foil wrapper there is a “love note” with a romantic phrase. In some countries like Vietnam, there is a different way to celebrate it. Couples wear the same style and/or color of clothes. In some parts of the Dominican Republic and El Salvador friends and family play games. All over the world people celebrate Valentine’s Day by expressing love to sweethearts, spouses and special ones. However, customs and traditions of celebrating the festival vary in different countries due to social and cultural differences. So where did the idea of giving chocolates on Valentine’s Day come from? From the moment chocolate was discovered it was considered valuable, divine and decadent, so what better gift to give a woman? The first chocolate candies (as we know them today) were invented in the 1860s by Cadbury, who was also the first to market them in a heart-shaped box for Valentine’s Day. The brilliance of marketers have certainly helped sales and popularity, but its aphrodisiac effect is surely one of the dominating factors underlying its status as a gift of choice. In addition to the aphrodisiac effects, research suggests that there are many more health related benefits. A healthy component of chocolate is its high level of antioxidant polyphenols. These are the same compounds found in red wine, fruits and vegetables that are touted for their heart-healthy and disease preventing qualities. 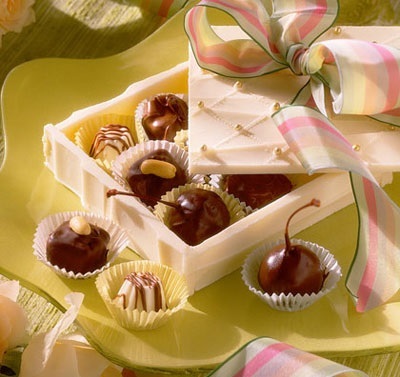 A chocolate’s taste, its smoothness and its aroma takes over one’s senses. As a matter of fact, there are few foods that people feel as passionate about as chocolate, a passion that goes beyond a plain old sweet tooth. For the true chocoholic, just thinking about chocolate can evoke a sensation of pleasure. Chocolate is mood-enhancing and, when eaten in moderate amounts, it is harmless to your health. In a medium bowl, mix cocoa powder with 1 1/2 cups very hot water until dissolved; set cocoa mixture aside. In a small microwave-safe bowl, place 1/4 cup cream and chocolate; microwave in 1-minute increments and stir until melted. Cool to room temperature. Transfer cooled chocolate mixture to a mixing bowl; add cheese and sugar. Using an electric mixer, beat until blended. Add remaining cream; beat filling until fluffy, about 2 minutes. Spread 1 cup of chocolate filling in the bottom of a 2-quart serving dish. One at a time, dip 6 ladyfingers in cocoa mixture, then arrange in a single layer in the bottom of the dish; spread with 1 cup of chocolate filling. Repeat with three more layers, ending with filling. 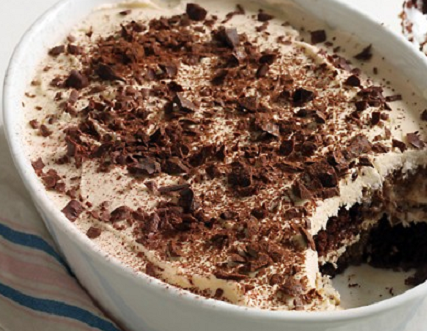 Cover tiramisu and refrigerate at least 2 hours (or up to 2 days). Dust with cocoa powder or shaved chocolate before serving. Preheat the oven to 350° F and line 4 muffin cups with paper liners. In a medium heatproof glass bowl set over a saucepan of simmering water, combine the chocolate chips with the butter, sugar, cornstarch and vanilla. Stir until the chocolate chips are melted and smooth. Remove the bowl from the saucepan and let the chocolate mixture cool slightly. Whisk in the whole eggs and the egg yolks. Spoon the batter into the lined muffin cups. Bake for 10 minutes, until set around the edges and soft in the center. Let stand for 5 minutes. Meanwhile, in a small bowl, whisk the apricot jam with the Amaretto until smooth. Invert the cakes onto plates and remove the paper liners. 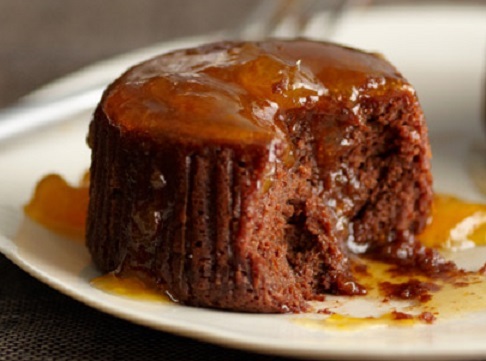 Spoon the apricot sauce around the cakes and serve. Using a sharp knife, finely chop the chocolate. In a bowl set over a saucepan of gently simmering water, heat the chopped chocolate, stirring occasionally, until it is about two-thirds melted; do not let the bowl touch the water. Remove the bowl from the saucepan and stir the chocolate until it is completely melted and the temperature registers 90° on a candy thermometer. If the chocolate has not melted completely and is still too cool, set it back over the saucepa of simmering water for 1 or 2 minutes longer, stirring constantly; do not overheat. 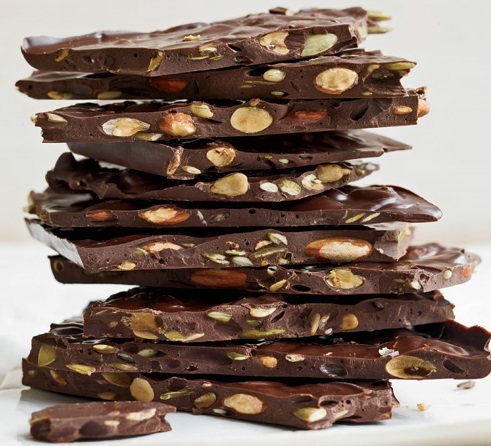 Stir the almonds and seeds into the chocolate and spread onto the prepared baking sheet in a 1/2-inch-thick layer, making sure the nuts and seeds are completely covered in chocolate. Refrigerate the bark for about 10 minutes, until hardened. Invert the bark onto a work surface. Remove the parchment paper, break into 25 pieces. MAKE AHEAD The broken bark can be stored in an airtight bag or container at cool room temperature for up to 10 days. 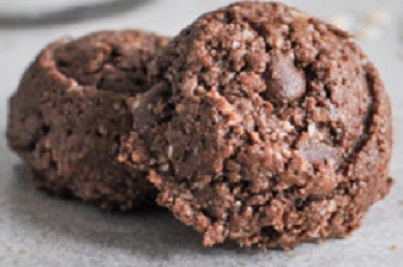 Combine ground almonds, ground oats, flour, cocoa, salt and chocolate chips in a mixing bowl. Combine maple syrup and oil and mix with the dried ingredients until well combined and forms a dough. Scoop out heaping teaspoonfuls onto a greased cookie sheet and bake for 15 to 20 minutes; cookies should be just set. Remove to a cooling rack. In a medium saucepan stir together chopped chocolate, sugar, water and cream. Bring to boiling, whisking constantly. Boil gently for 1 minute. Remove from heat and stir in vanilla. Cover and chill overnight. Freeze mixture in a 1-quart ice cream freezer according to manufacturers directions. Store in the freezer for a few hours before serving. 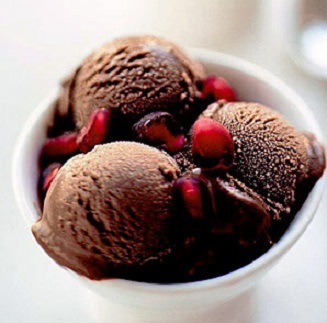 To serve, scoop into small glasses or dishes and garnish with pomegranate seeds.